I was already a fan of Newark mayor Cory Booker, but after his latest super hero exploit I think my fondness his turned to adulation. After sending out a tweet thanking everyone for their concern, it was learned that mayor Booker was off to the hospital to be treated for smoke inhalation because he had helped rescue a woman from a burning building. Yep you read that correctly. I bet your mayor never did anything like that for you. Talk about going over and above the call of duty. Bump Rudy Guilani, I think Cory Booker deserves the title of America's mayor. Booker was released from a New Jersey-area hospital at about 11:30 p.m., according to the mayor's spokeswoman, Anne Torres. 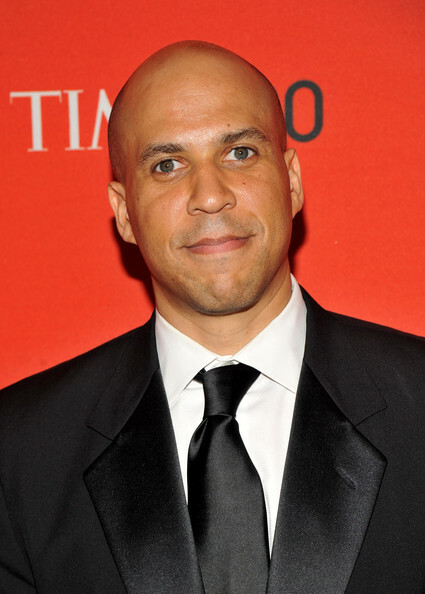 The incident occurred at a building next to Booker's home, the mayor told CNN Friday. The mayor had returned home to see flames shooting out of a second- floor kitchen window. Flanked by two members of his security detail, Booker rushed toward the building, he said. "Something exploded and sent a lot of flames over the steps, and my detail just grabbed me and started trying to drag me out of there," Booker said. There was a "bit of an altercation," but he convinced the security personnel to let him go. Booker said he ran through the kitchen and into a smoke-filled room, where he had trouble finding the woman. "I looked back behind me and saw the kitchen was becoming more of an inferno, and at that point I thought to myself, 'this is it,' " he said. But the woman called out and he was able to grab her from a back bedroom, run back through the burning kitchen, and to safety. "He ran in -- without thinking for his own safety -- ran upstairs and assisted in rescuing the young lady," Det. Alex Rodriguez, who witnessed the incident. "He burned his hand trying to pull the lady out." The detectives who were with him helped get them out of the house. The woman was taken to a hospital and was in stable condition. "I'm very grateful this morning that I'm ok, and that everyone else is as well," Booker said. I agree 100%. My family laughs b/c I say, "My boyfriend, Mayor Booker..." If only. He could only be our boyfriend though...he won't get married until all of his constituents can legally be married as well. Just one more reason to <3 him! Mayor Booker is very easy to like. Seems to be able to be genuine and authentic yet a political figure.